The Very Short Introductions (VSI) series combines a small format with authoritative analysis and big ideas for hundreds of topic areas. Written by our expert authors, these books can change the way you think about the things that interest you and are the perfect introduction to subjects you previously knew nothing about. Grow your knowledge with OUPblog and the VSI series every Friday, subscribe to Very Short Introductions articles on the OUPblog via email or RSS, and like Very Short Introductions on Facebook. At a time when the press and broadcast media are overwhelmed by accounts and images of humankind’s violence and stupidity, the fact that our race survives purely as a consequence of Nature’s consent, may seem irrelevant. Indeed, if we think about this at all, it might be to conclude that our world would likely be a nicer place all round, should a geophysical cull in some form or other, consign humanity to evolution’s dustbin, along with the dinosaurs and countless other life forms that are no longer with us. While toying with such a drastic action, however, we should be careful what we wish for, even during these difficult times when it is easy to question whether our race deserves to persist. This is partly because alongside its sometimes unimaginable cruelty, humankind also has an enormous capacity for good, but mainly because Nature could – at this very moment – be cooking up something nasty that, if it doesn’t wipe us all out, will certainly give us a very unpleasant shock. After all, nature’s shock troops are still out there. Economy-busting megaquakes are biding their time beneath Tokyo and Los Angeles; volcanoes are swelling to bursting point across the globe; and killer asteroids are searching for a likely planet upon which to end their lives in spectacular fashion. Meanwhile, climate change grinds on remorselessly, spawning biblical floods, increasingly powerful storms, and baking heatwave and drought conditions. Nonetheless, it often seems – in our security obsessed. tech-driven society – as if the only horrors we are likely to face in the future are manufactured by us; nuclear terrorism; the march of the robots; out of control nanotechnology; high-energy physics experiments gone wrong. It is almost as if the future is nature-free; wholly and completely within humankind’s thrall. The truth is, however, that these are all threats that don’t and shouldn’t materialise, in the sense that whether or not we allow their realisation is entirely within our hands. The same does not apply, however, to the worst that nature can throw at us. We can’t predict earthquakes and may never be able to, and there is nothing at all we can do if we spot a 10-km diameter comet heading our way. As for encouraging an impending super-eruption to ‘let of steam’ by drilling a borehole, this would – as I have said before – have the same effect as sticking a drawing pin in an elephant’s bum; none at all. 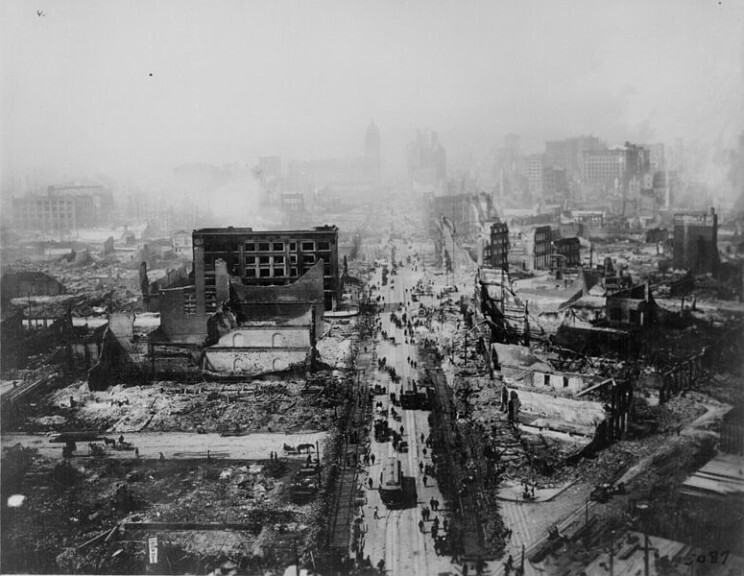 San Francisco after 1906 earthquake. National Archives, College Park. Public domain via Wikimedia Commons. The bottom line is that while the human race may find itself, at some point in the future, in dire straits as a consequence of its own arrogance, aggression, or plain stupidity, this is by no means guaranteed. On the contrary, we can be 100 percent certain that at some point we will need to face the awful consequences of an exploding super-volcano or a chunk of rock barreling into our world that our telescopes have missed. Just because such events are very rare does not mean that we should not start thinking now about how we might prepare and cope with the aftermath. It does seem, however, that while it is OK to speculate at length upon the theoretical threat presented by robots and artificial intelligence, the global economic impact of the imminent quake beneath Tokyo, to cite one example of forthcoming catastrophe, is regarded as small beer. Our apparent obsession with technological threats is also doing no favours in relation to how we view the coming climate cataclysm. While underpinned by humankind’s polluting activities, nature’s disruptive and detrimental response is driven largely by the atmosphere and the oceans, through increasingly wild weather, remorselessly-rising temperatures and climbing sea levels. With no sign of greenhouse gas emissions reducing and concentrations of carbon dioxide in the atmosphere crossing the emblematic 400 parts per million mark in 2013, there seems little chance now of avoiding a 2°C global average temperature rise that will bring dangerous, all-pervasive climate change to us all. Sakurajima, by kimon Berlin. CC-BY-SA-2.0 via Wikimedia Commons. The hope is that we come to our collective senses and stop things getting much worse. But what if we don’t? A paper published last year in the Royal Society’s Philosophical Transactions, and written by lauded NASA climate scientist, James Hansen and colleagues, provides a terrifying picture of what out world will be be like if we burn all available fossil fuels. The global average temperature, which is currently a little under 15°C will more than double to around 30°C, transforming most of our planet into a wasteland too hot for humans to inhabit. If not an extinction level event as such, there would likely be few of us left to scrabble some sort of existence in this hothouse hell. So, by all means carry on worrying about what happens if terrorists get hold of ‘the bomb’ or if robots turn on their masters, but always be aware that the only future global threats we can be certain of are those in nature’s armoury. Most of all, consider the fact that in relation to climate change, the greatest danger our world has ever faced, it is not terrorists or robots – or even experimental physicists – that are to blame, but ultimately, every one of us. 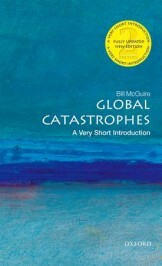 Bill McGuire is Professor Emeritus of Geophysical & Climate Hazards at University College London. His current books are Global Catastrophes: a Very Short Introduction and Waking the Giant: How a Changing Climate Triggers Earthquakes, Tsunamis and Volcanoes. I know I’m quibbling so please forgive but language is important. We are at present in an ice age that has been going on for around 2.5m years. The recent ice sheets were in a “glacial” or if you like Glacial period and we are at present in the Holocene interglacial period. The most recent glacial began to end around 20,000 years ago and melting really got under way about 11,000 years ago. Other than that, I think your predictions are very likely right on the money.